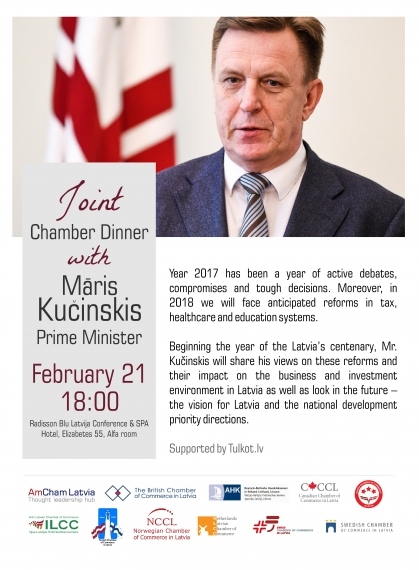 Dear DCCL Members, American, British, Canadian, Danish, Netherlands, Norwegian, Swiss, Swedish, Irish, Finnish and German Chambers of Commerce kindly invite you to a dinner with Māris Kučinskis, Prime Minister of Latvia. The event will take place on February 21, 18:00 (registration and reception from 17:00) at Radisson Blu Latvija Conference & SPA Hotel, Alfa room. This event will serve as a forum for discussion about issues that are relevant to the foreign investor community and provide a unique networking platform with 11 biggest foreign chambers. If you would like to become a sponsor of this high-profile event, please see the sponsorship proposal.